Craig Megson, a life-long UFO enthusiast, has come forward with footage that he believes shows a fleet of alien spacecraft flying over Fishergate. The 35-year-old said the footage, filmed in February, is 'compelling evidence' for the existence of extraterrestrials. Craig was returning home from a day out in Blackpool with his 6-year-old son when his eyes were drawn to the skies above Preston. He said: "We'd had a fantastic day in Blackpool and we were just changing trains in Preston when it happened. 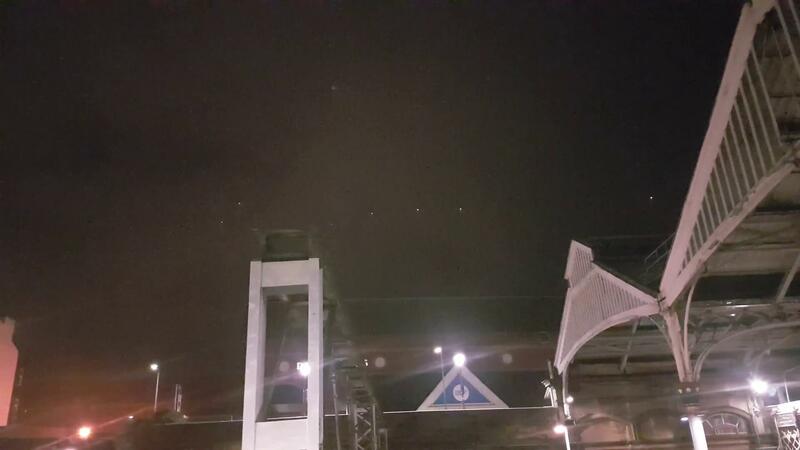 "I went outside the station for a vape and I noticed these lights in the sky. I showed them my son and he found it quite funny. He just looked at me and laughed. "I saw these lights move silently across the sky and then more came along. So I got my phone out and started filming. "At first I thought they were planes, but there was no flashing lights or sound. Then more came along and I thought they might be Chinese lanterns. But they don't move in formation like that do they? "Plus, it was a windy night and I remember thinking, I've seen Chinese lanterns before but they've never moved like this!" Craig said he was soon joined by other curious spectators who were drawn to the mysterious lights in the sky. "There were a lot of people around, at least 20, and we started talking about what they could be", said Craig. "I asked the man next to me what he thought they could be and he simply said, "They're not planes mate, that's for sure." Tim Dust, from Denver, Colorado, runs popular YouTube channel UFO MAN; he said: "in regards to these lights, they are legitimate unknowns. I have years of experience analysing footage of unidentified phenomena in our skies and I can say for sure these are not Chinese lanterns. "I know this because of their continual horizontal flight path. Lanterns will rise with the air currents and flicker out. These lights are steady. "They most likely are not drones either, because they made no sound and did not have navigation strobes. "There were a number of other witnesses to this sighting, besides the videographer, as can be seen in the clip, so I can definitively rule it out as a hoax. "In my opinion, this is very good evidence to support UFO activity as ongoing over the U.K." Skeptics of flying saucers have suggested that the mysterious lights could be satellites or other unidentified aerial phenomena. But Craig insists that what he recorded that night is the proof he has been seeking for years - proof that we are not alone. He said: "I've been into UFOs all my life and I've seen a lot of strange things in the sky around Lancashire. So getting this video kind of meant a lot to me. "I must admit I've seen a lot of strange lights over the years but not like this. This is on a different scale. If anyone needs proof of the existence of aliens, here it is." BEAMS Comment: The thing about these lights is, they do not flicker like Chinese lanterns - and they don't have that familiar orange look to them either; another point to note is, just how evenly spaced they are; it is highly doubtful whether a group of paper lanterns could fly together in such perfect unison. What do you think of the strange lights in the sky?